Professor Donald Metcalf is internationally renowned for his pioneering medical research on the control of blood cell formation. This fundamental research has been used in the treatment of millions of cancer patients around the world. 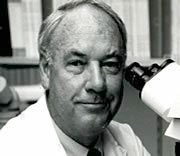 Born in 1929, Donald and his researchers at the Walter and Eliza Hall Institute in Melbourne made their scientific breakthrough in the 1960s when they began the task of isolating, purifying and cloning natural hormones called colony stimulating factors (CSFs) which stimulate the production of white blood cells. They established that CSFs could be given to cancer patients, enabling them to have stronger treatment and to recover faster.